Almost four years after the UN General Assembly declared Nov. 2 as the International Day to End Impunity for Crimes Against Journalists (IDEI), the date has become a time for media professionals and freedom of expression groups in Latin America and the rest of the world to call attention to levels of violence and impunity affecting their colleagues. According to UNESCO, it has recorded the murders of 930 journalists in the last eleven years. Additionally, it added that no one is punished in nine out of ten cases. Last year, the organization reported numbers showing that in the previous decade, only 11 percent of homicides of journalists that occurred in Latin America and the Caribbean had been resolved. 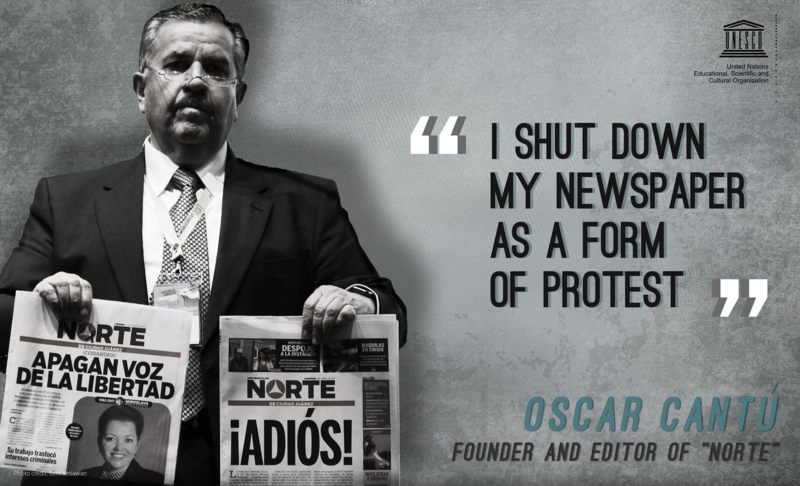 As part of its #MyFightAgainstImpunity campaign, which highlights six interviews with journalists, human rights activists and relatives of journalists who have been killed, UNESCO shared the story of Oscar Cantú, founder and editor of newspaper Norte in Ciudad Juárez, Mexico. Cantú shut down the paper in April 2017 following the murder of one of its journalists, Miroslava Breach. "Learning about her death was traumatic for me. Not only because I lost a dear colleague, but it also made me realize that we are still not able to exercise our right to inform the public," Cantú told UNESCO. "Since Norte was founded 27 years ago, the conditions for exercising journalism have not changed." The newspaper founder pointed out that more than 11 journalists have been killed in Mexico this year alone. "I shut down my newspaper as a form of protest, as a demand that the criminals who kill journalists are brought to justice. When we achieve justice, we will open again," he said. Cantú also called for media to constantly remind the public about the unsolved cases of crimes against the press. 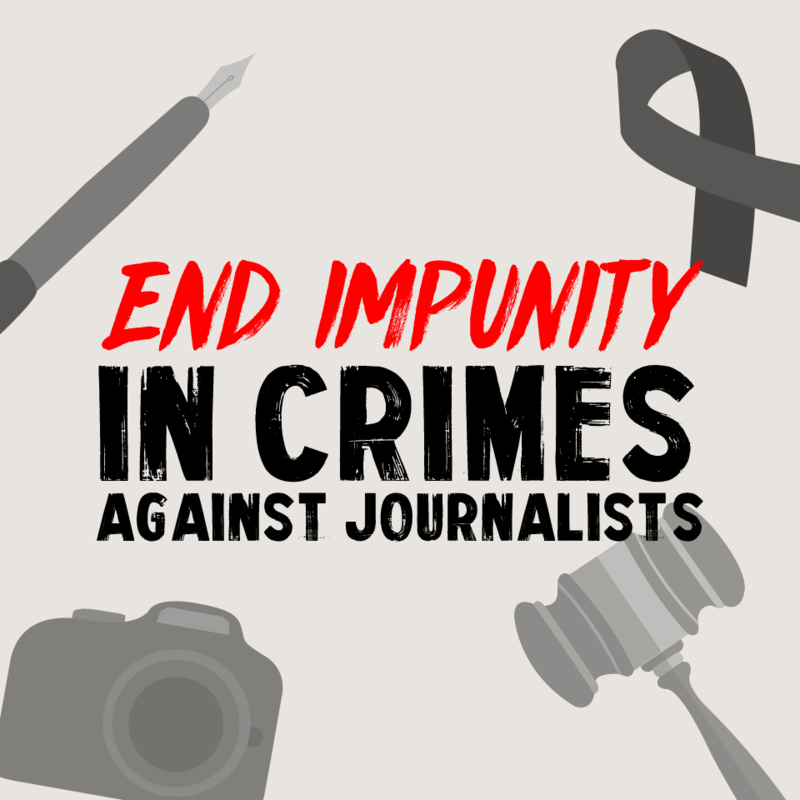 To mark IDEI, like UNESCO and Cantú, freedom of expression and journalism organizations in Latin America and around the world publish about cases of violence against journalism and subsequent impunity, and push governments to do more to protect media workers. The Committee to Protect Journalists (CPJ) released its Global Impunity Index that once again showed Mexico and Brazil among the countries with the highest levels of impunities in crimes against journalists in the world. IFEX and its members continued the No Impunity Campaign to elevate “the voices of victims to the international stage” and call “on governments to uphold higher standards of justice and accountability.” They focused on “five emblematic cases of impunity,” including that of journalist Jineth Bedoya in Colombia, who was abducted, tortured and sexually assaulted by paramilitary members while reporting a story at a prison in 2000. Though some arrests have been made in her case, the trials are ongoing and she has been called to testify in court multiple times. She created the campaign #NoEsHoraDeCallar (Now is not the time to be silent) to fight sexual violence against women. UNESCO published an interview with Oscar Cantú, founder and editor of Norte, as part of the #MyFightAgainstImpunity campaign. To participate on social media and share their own stories, users marked their posts with hashtags like #EndImpunity, #JournoSafe and #SayNoToImpunity. In the days preceding IDEI, some organizations officially launched projects that would not only increase awareness of journalists who were murdered for their profession, but also ensure their investigations were not stopped. The Brazilian Association of Investigative Journalism (Abraji for its acronym in Portuguese) began the Tim Lopes Program for the Protection of Journalists. Named after a TV Globo reporter killed while reporting in a Rio de Janeiro favela in 2002, the project aims to investigate murders, assassination attempts and abductions of media professionals and to continue their reports. Reporters Without Borders (RSF for its acronym in French) and the Freedom Voices Network officially launched the Forbidden Stories project which provides a platform for journalists who are being threatened to upload their work. In the event that a journalist cannot continue their investigations, potentially due to threats or death, the organization can continue and disseminate their work. The organization began the project by promoting the stories of three journalists recently killed in Mexico for their work. UNESCO and the Latin American Congress of Investigative Journalism (COLPIN) planned to launch the initiative “Who investigates the crimes against the investigators?” at the 2017 congress in Buenos Aires, Argentina on Nov. 2.